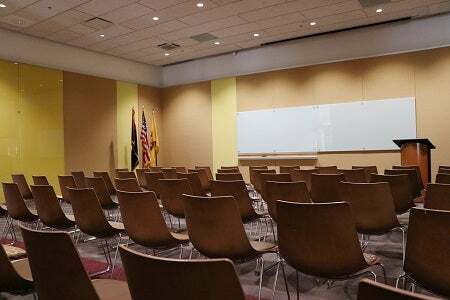 The Student Center at the Post Office offers various spaces for student organizations and ASU colleges/departments to hold meetings, workshops, conferences and special events. Simply view the room specs below and the available set-ups and A/V capabilities to find the room that works best for your needs. Not sure where to start, or have a special request, contact us and we will do our best to accommodate your needs. Reserve your space today. Notes: Standard set up is one large table seating 10-15 chairs; Furniture can be rearranged.